Do you really think the iphone 7 plus needs an introduction? Whenever apple decides to release its latest version of any device you should always expect something massive. One thing I have come to understand is Apple always take advantage of the crude criticisms it gets to shape their devices. When you compare the iphone 7 plus to its predecessor you would notice it has a finer design. In addition to its high speed processor, there is the now trending dual camera at the back of the device. According to GSMARENA, while the 7+ isn't the first to slap two snappers next to each other, it is the first to attach telephoto lens onto one of these. Another very important feature on the iphone 7+ is that it is waterproof. How about those underwater selfies? Remember Apple's tenth year anniversary comes up next year? so don't expect too much from this device, because Apple is definitely going to have something to add to its collection next year to mark the celebration. But in the meantime, lets look at the iphone 7+ thats here already. Apple kept its phone's body build the same for the third consecutive time in 3 years, you may even find it very difficult to distinguish the iphone 6s+ and iphone 7+ if you are far off. But one notable feature that separates the iphone 7+ from the rest is the dual camera at the back. The iPhone 7 Plus is big for a 5.5-inches mostly because of its beefy bezels and huge Home key below the screen. Another thing that distinguished the iphine 7+ is that there is no longer an analog audio jack opening at the bottom. There are also two new paint jobs - Matte Black and Jet Black, replacing the previous Space Gray. Like I said earlier, one of the most distinct upgrade on the iphone 7+ is that it is completely waterproof, all thanks to Apple for removing the audio jack. In terms of brightness the iphone 7+ comes with 570nits which is a bit lesser than what the iphone 6s has. Though when you set your brightness at Auto, the screen can get up to 680 nits bright. The best part of the new screen is the fact that it's got a factory color calibration. On a single charge the iphone 7+ can can do about 18 hours of 3G calls or 13 and a half hours of web browsing or you can watch videos for about 8 hours. The charge time of this device is about 4 hours when you use its recommended charger of 5v/1A, though using other chargers made by manufacturers (5v/1A) you can quickly get the device's tank filled up in over 2 and half hours. The iphone 7+ comes with a revamped camera abilities, it comes with an updated 12MP sensor which faster and efficient than the iphone 6s. But the best innovation on this device is the 12MP camera that sits houses a 12MP sensor. This device comes with a very smart, sharp and fast camera that you can snap over a hundred photos without the device slowing down or getting hot. 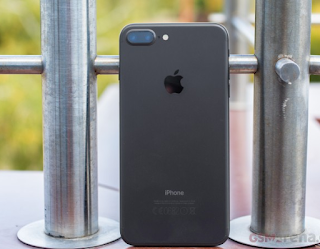 In all, I can assure you that Apple did its best to make the iphone 7 plus an attractive look, more surprisingly, it is not too expensive.